When on the west coast of Scotland earlier this year, I was lucky enough to spend a whole afternoon watching an otter at play in and around a sea loch. 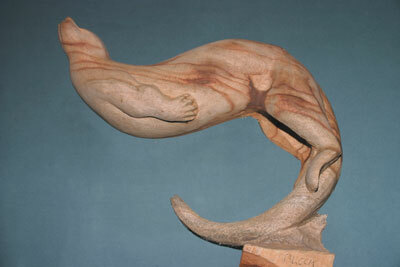 I was so impressed by the animal's fluidity of movement and graceful form that I decided to carve a very simple, stylised otter. This would also give me some much-appreciated relief from most of my recent commissions, which have involved some very detailed feather work. With any stylised form, it is important to get a good shape that is both attractive and conveys the essential elements of the subject without employing much detail. As ever, background research is important and although I had been lucky in actually watching an otter for some time, I also found it beneficial to watch as much footage of otters swimming underwater as I could; as well as collecting photos and drawings of otter anatomy. Building up a picture of how the animal actually 'works' is important, even with simple forms. 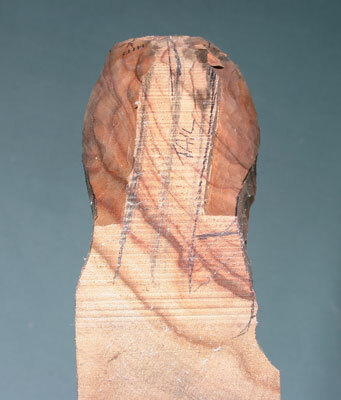 Once a design had been settled upon, a clay maquette was produced. 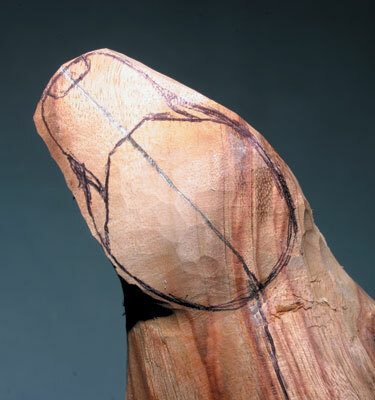 This is not always necessary but it can often help to ensure that the final shape - along with any final tweaking - is correct before committing it to the wood. 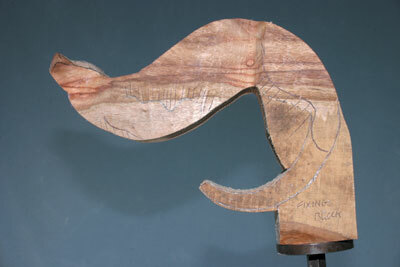 The maquette was then photographed from all angles including the top, and some templates, at the desired scale to fit the wood, were drawn up from these. 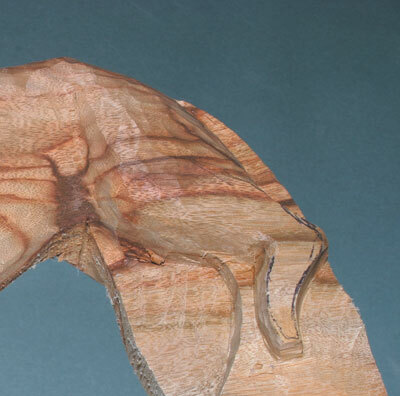 I chose a piece of camphor laurel (Cinnammum camphora) for this piece; it carves moderately well and has a beautiful grain. With more detailed pieces, such as the feather detail on a bird of prey, any complicated grain can fight with the detail on the bird, making the final piece confusing and difficult to see. 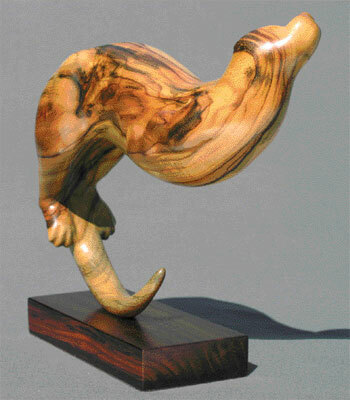 A simple shape lends itself to a piece of wood where the grain can be as much the star as the final shape. Camphor laurel smells just like vapour rub and is great to use if you have a cold - I hasten to add that I have no medical evidence to back this up - but it can also be slightly overpowering at times. Enlarge the plans in diagram one to the required size, making sure that it fits within the size of your chosen wood block. Cut around the outline of one of the side views, and position this template on the wood so as to optimise the good features - such as colourful heartwood or swirling grain - and reduce the number of undesirable features such as knot holes, splits, bland grain, etc. Also, some attention should be paid to the direction of the grain. Ideally, I would have positioned the template so that the wood grain ran up the tail from the fixing point, up to the hind feet (see photo 5). This would give extra strength for the part of the carving - in this case the tail - that was relatively narrow in the cross section, and would be supporting the weight. Unfortunately, this optimised positioning relative to the grain was unobtainable with the size of the available timber, but enough strength could be given to the tail by extending the threaded rod that the piece would be mounted on, diagonally up the inside of the tail. Once the template position has been chosen - and take your time on this - draw around the outline then bandsaw, jigsaw or handsaw around this line (see photo 6). 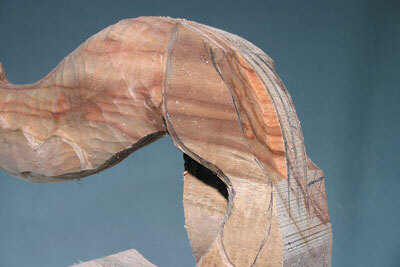 As can be seen in photo 6, it is a good idea to leave a block of wood attached at the tail end. 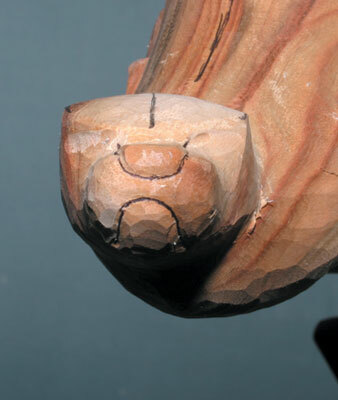 This serves two purposes: firstly, it gives a good strong area to hold in a vice, or to screw the fixing plate to a carving clamp, and secondly, it gives strength to the potential weak area of the tail during the early stages of carving. 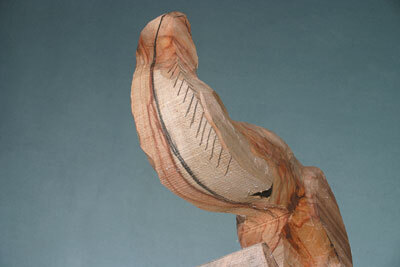 There is no real mystery to carving. It is a matter of identifying the material that is not required and removing it. This is very difficult if approached from the premise that this is done all in one step, but if broken down into many steps, the task is made easier. Look at your sculpture and mark with a pencil a small area that is not wanted, or is obscuring the surface that is finally required. Remove the wood that is marked. How deep do you go? This could depend on confidence, but at the very least, just remove the pencil marks - then look again. If the same area needs more removed, mark it again, and remove the pencil marks. Repeat and repeat and repeat, until you can find no more wood that needs to be removed. At that point you have finished. Position the work so that you can look directly down on it, and using the plan view template, draw an approximate outline on the wood (see photo 7). 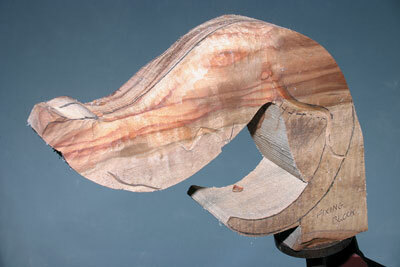 Take care not to fold the template around the curves as it is positioned over the wood. This will distort the outline being drawn. Remove the wood outside this outline using a combination of gouges, but finishing off with a fairly shallow sweep of gouge - say 3/4in No.5 (see photo 8). Needless to say, all tools should be sharp and should be kept sharp by frequent honing. Care should be taken at all times to cut through the fibres of the wood. Direct the cut at a complementary angle to the direction of the grain, so as to avoid pieces splitting that you would have otherwise quite liked to keep. 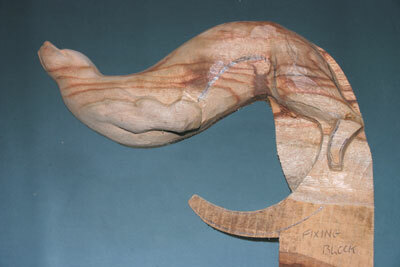 Something that always helps me when carving most animals is to draw in the line of the spine as early as possible. This helps immensely with keeping symmetry in the body, even if it bends and twists, as in the case of the otter. 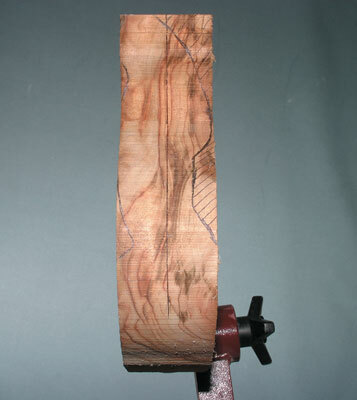 Draw in the spine line along with the centre line for the head (see photo 9). Move to the left side and mark the outlines for the front and rear legs, then run around these lines with a V-tool (see photos 10-11). Move to the top left edge that runs along above the left foreleg. Mark the sharp corner, then round the body from the bottom of the V-cut of the foreleg, in a curve up to the spine line (see photo 12) using a shallow gouge (3/4in No.4). 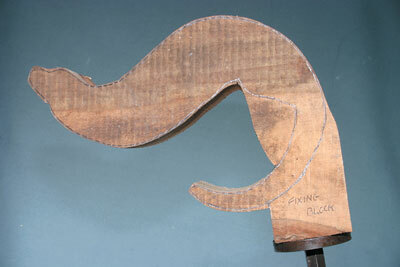 Now tackle the same kind of curve for the belly area in front of the rear leg, and just behind the foreleg. 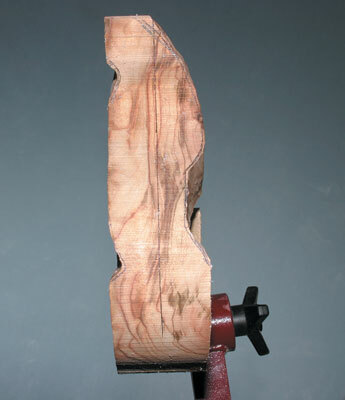 Mark the corner to be rounded off and then curve over this area, defining the front edge of the rear leg with a soft transition, using a gouge (1/4in No.10) to deepen the initial V-cut as dictated by the curvature of the belly (see photo 13). In a similar way, curve the chest area from the bottom of the V-cut at the lower edge of the foreleg, round to a centre line drawn along the middle of the belly, to mirror the spine line (see photo 14). Repeat these stages on the right hand side of the otter. Mark the areas either side of the tail and up to the back of the hind legs (see photo 15). Remove this segment of wood with a V-tool and shallow gouge, keeping the sides of the cut square to each other (see photo 16). Mark the rear edge of the left hind leg and round the corner off (see photo 17). Repeat this process for the other side (see photo 18). 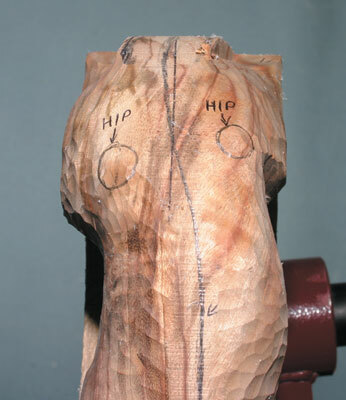 It is quite a nice effect to leave a couple of slightly raised areas to indicate the hip-bones (see photo 19). Notice how they are set at an angle to emphasise the bend of the body at that point. 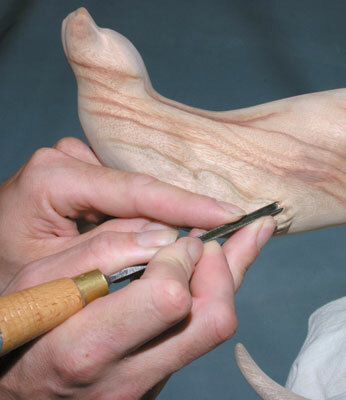 Round off the leading edges of the rear legs, and shape the hind feet by running around your pencil lines with a V-tool (see photo 20). 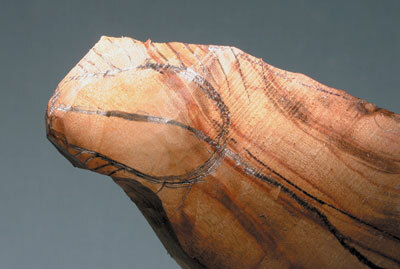 Put in a hint of musculature by first marking the low points that will create the definition. Run over these guide lines with a 1/4in No.10 gouge, round off any sharp edges, then sand with 180grit sand paper (see photo 21). 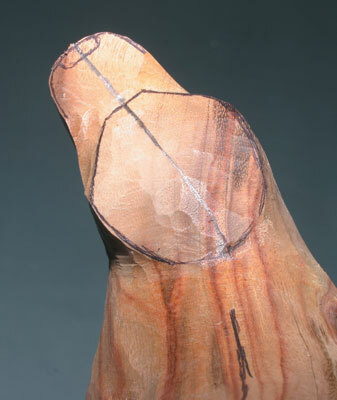 Carve an impression of the webbed feet by using a 1/8in No.11 gouge, to remove the wood between the toes (see photo 22). 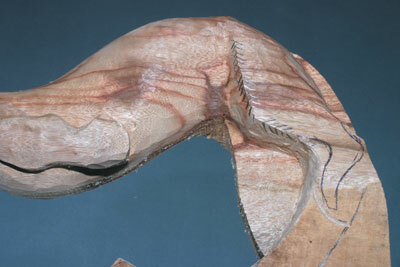 Expose most of the tail by removing the wood either side as viewed from above and side (see photo 23-24). 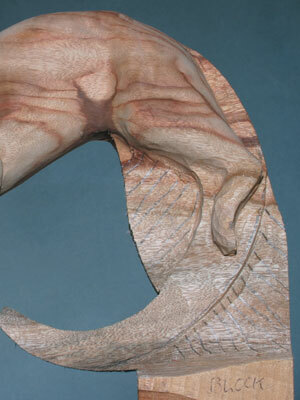 While still leaving just enough attached to hold the piece, round off the tail (see photo 25). From the plan view, draw a refined outline for the head along with the angle of the brow ridges, relative to the centreline. 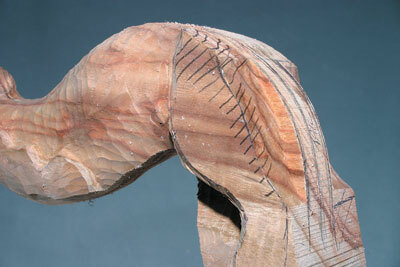 Carefully cut to outline and remove the wood that lies above the muzzle, but in front of the brows (see photos 26-27). 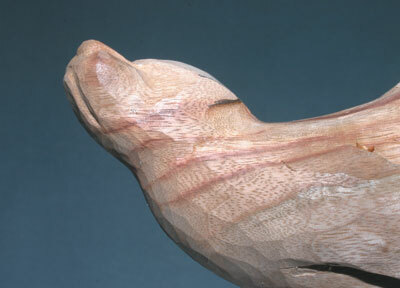 Curve the muzzle as viewed from the front, and edge carefully around the nose with the 1/8in No.11 gouge, then line in the lower jaw with the V-tool (see photo 28). 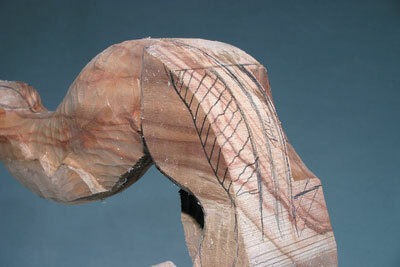 Finally, mark in the very subtle ears and edge around behind them with the 1/8in No.11 gouge (see photo 29). 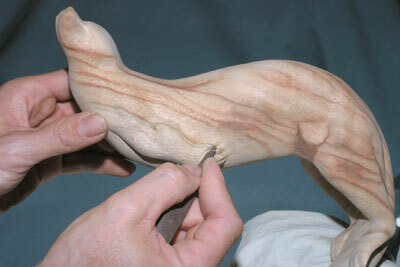 Go over the entire carving, refining the shape, adding any additional musculature and cleaning up any messy tool marks. Finish off all convex curves by lightly going over them with a flat chisel to smooth over the faceted look created by the gouge marks. 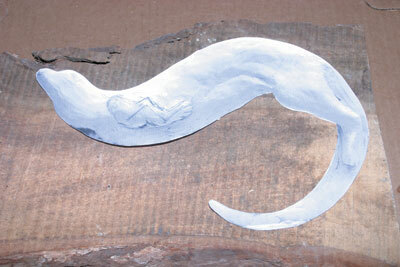 At this point, it is time to carefully remove the nearly completed otter from the supporting block. When satisfied with the shape, sand all over with 180grit, making sure that all the tool marks that you want removed are totally erased at this stage. Don't rely on the subsequent grades of sandpaper to do anything more than remove the scratches of the previous grit. Work through the further grades of 240, 320 and 400grit. To sand into the more detailed areas, try rolling the abrasive into a tight cone shape and work carefully with the pointed end (see photo 30). A light going over with 0000 wire wool will give a silky smooth finish. Remove any dust and apply finishing oil with a brush, dabbing off excess with kitchen roll. Leave for 24 hours before a light rub down with the 0000 wire wool, and a second coat of finishing oil if required. Finally, after another 24 hour drying period, the finished sculpture can be waxed polished then mounted onto a suitable base. 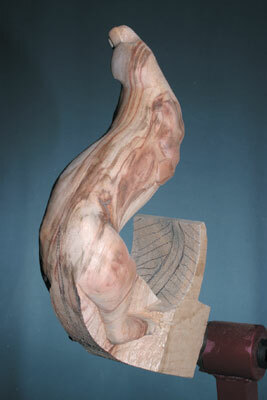 The finished sculpture can then be mounted on rosewood. 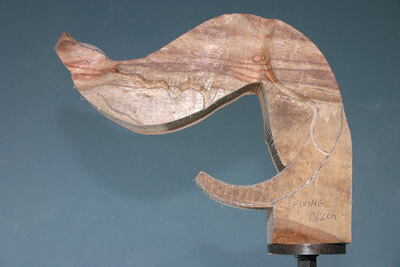 "There is no real mystery to carving. It is a matter of identifying the material that is not required and removing it"